Table Grove High School "Tigers"
Table Grove (population 396) is located in western Illinois in the westeern portion of Fulton County. U.S. Route 136 is the main roadway leading to and from Table Grove and connects it to its well-known neighbor 17 miles to the northwest, Macomb. The BNSF Railroad runs through Table Grove as well. The town was originally platted in 1837 and incorporated as a village in 1881. Table Grove peaked in population in the 1920s through 1940s at nearly 800 residents. 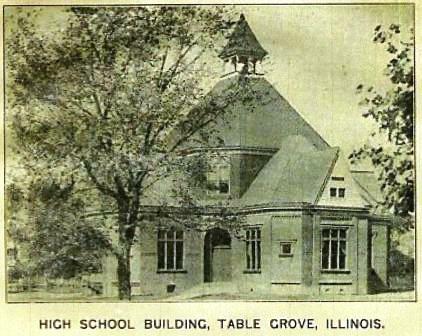 One article on the history of Table Grove can be found at http://www.vit.k12.il.us/community/tg.htm . The first school house in the area of Table Grove was established in 1845. Think about that for a moment, 16 years BEFORE the start of the Civil War!! A high school was started in the late 1880s, with Corneila Cook Wait becoming the first graduate in 1891. 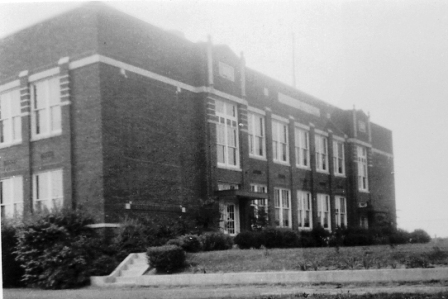 A newer community high school was incorporated in 1920. 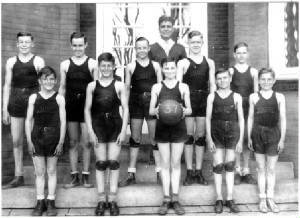 The high school served the children of Table Grove quite nicely through the 1940s. Consolidation talks arose at that time between Table Grove and the neighboring towns of Ipava and Vermont (both also on this site). The consolidation effort became a reality in 1948 with the establishment of the Vermont-Ipava-Table Grove School District. The Table Grove HS bldg was used for the VIT HS from 1948 - 1957. An all-encompassing complex was developed in 1958 near Table Grove to house the students of the new district from Kindergarten through Senior year. A new school complex for the Table Grove V.I.T. School District was built in a country setting near Table Grove. The Table Grove High School buildings pictured on this page have been razed. Table Grove HS nickname: "Tigers"
To bring to our fair school a victory. Table Grove High School definitely offered baseball, basketball, football, and track for its boys. School fight song, conference affiliation, coach's names, and records of the better teams are currently not available. John Marshall has the Table Grove Yearbooks from ’10, ’12, ’13 and ’37. John writes to us: "Though the information from those periods is somewhat sketchy, I will provide you with the following data for Table Grove High School. 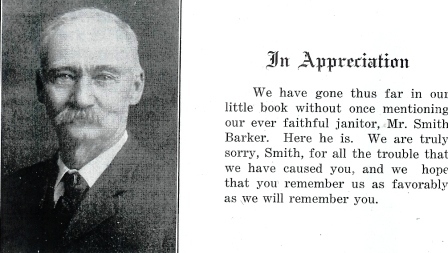 Oddly enough, the yearbook for 1912-13 explains that a new emphasis was to be placed on academics. Thus the “clubs” will be maintained, but apparently no games were played that year." Don't think because we had no Fall or Winter Athletics that we had no material. We had the "makin's" of a football team all right, but for lack of backing we failed to organize. Upon requesting for a loan from our superiors we were emphatically told, "nothin stirrin'". You'll excuse us." The boys basketball program at Table Grove High School had some very nice seasons of success. A District title was won in 1943 to help prove that point! Unfortunately this is the only mention of the roundballers at TGHS on the IHSA website (www.ihsa.org). We are searching for the records and coaches names of the better teams that graced the courts of Table Grove High. "The basket ball season of '10-'11 opened with four men of last year's team in school. After a trial of all the material in school, Ralph Hunter and Myles Robinson were picked to fill the two vacant places. A new ball was purchased and practice began early in the year and by the time the season opened the team was ready with good team work and signals. Walter Pickering was given the rule book and accompanied the team as referee, and his work was very satisfactory to both home and visiting teams. There were seven games played, with four victories for us and three defeats, which is a very creditable showing, when some of the difficulties that games were played under are taken into consideration"
"Our boys basket ball team started out with plenty of spirit and material. But we found ourselves at a great disadvantage in not having a building in which to practice. Nevertheless, we managed to play a few games, of which the closest of the season was that with Good Hope. In this we proved victorious, with the score of 12 - 11. Table Grove Basket Ball they're all right! One Table Grove High School thinclad let the rest of Illinois know that the kids from his town could run with the best of them. In 1923 a male trackster named C. Chenoweth placed 4th in the mile run in the IHSA 'B' Track Meet! 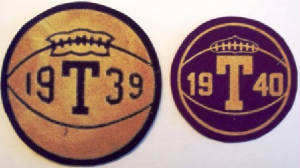 The TGHS boys played football too, and did so very early on in their school history. 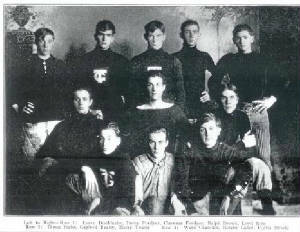 To view a photo of the boys football team of 1909 check out this web address sent to us by John Bybee - http://www.illinoisancestors.org/fulton/photographs/footballteam_1901.jpg . If you have any further information about the Table Grove High School football program, please contact us at ihsgdwebsite@comcast.net . Some early records as found in yearbooks located by John Marshall are included below. "Last fall the boys' football team started out with plenty of good material for a strong and fast team, but owing to the objections of parents, there were only two games played. The boys were mostly beginners, so know little about the game, therefore we lost both games played, altho we put up a good fight for them." 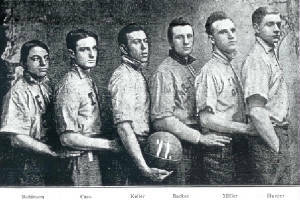 "The foot ball team of the Fall of 1911 began with practically a new lineup. The encouragement of Wayland Ross, the captain, did much to keep the team together and get good practice. The players were nearly all new and inexperienced, but enthusiasm was started by the winning of the first game with a score of 23 - 0. Altho they were defeated in a few games, good courage was kept up all the time, which showed the grit of old Table Grove High." 1940-41 A photo of the 1940-41 football team was provided to us below by John Bybee. The gentleman in the back row, fifth from the left, became a Fighter Pilot for the AAF in World War II. Thank you for your service Evan Hughes! 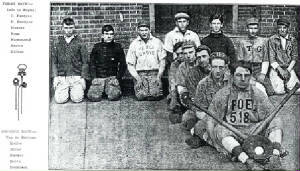 The Tigers were quite competitive on the baseball diamond as well. The following records were sent to us by John Marshall, as found in TBHS yearsbooks of these particular years. 1909-10 6 - 0 Undefeated Season!! 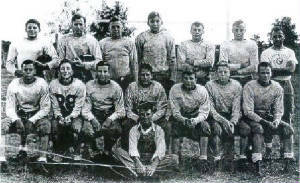 "Six games were played with other schools and all were won (in 1909-10) by Table Grove, and when we consider the size of the schools played, this was a good showing." "As the Fad was printed too early for the base ball schedule of this year, the last year's schedule was printed. 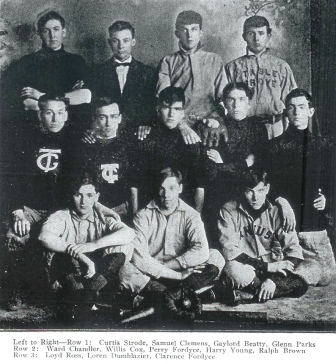 THe season of 1910 opens with a very good team in school and it was organized with Edson Robinson as captain and H.L. Dyar as manager. This year there are two vacant places on the team, but there are several good players in school to choose from who will make good by a little practice, and we hope to keep up the good record that has been made before." 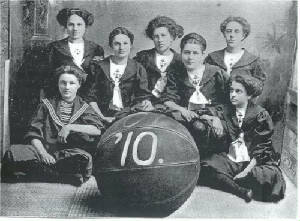 John Marshall provided information about the girls basketball team of 1909-1910. The ladies won the Fulton County championship and had an incredible record of 7 - 1. The record and a short write-up is available below. 1909-10 5 - 2 Fulton County Champs!! 1910-11 9 - 1 - 1 Fulton County Champs!! 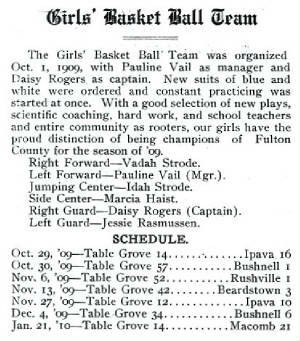 "This is the fourth year of the existence of girl's basket ball in the Table Grove High School. With the opening of school last September, it was found that only two of the former team players remained to contribute their ability and experience toward making up a team which would hold the record that the former team held. In the beginning things looked rather discouraging and so strong a team was hardly expected. However, the girls went to work and came out with surprising success, notwithstanding, the obstacles contended with. With the same good spirit that has always stood forth, a team was developed which, up to the present time, is the champion of Fulton County. The success of the team is partly due the good spirit with which the home patrons supported the team. Susannah Barker proved to be an excellent manager and helped the team in many ways." 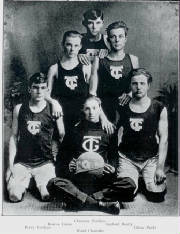 "The basket ball season of 1911-12 proved a failure in almost everything attempted. We lost two players who were the equals of any two players on any high school team in the West. Notwithstanding the hardships, we got together a team which did some practicing, but very little playing, for, owing to the rules of the Association to which we belong, we were unable to play more than one interscholastic game, in which one we were victorious. (beating Good Hope HS 30-18)"
And we're ready when the whistle blows. There was a ton of school spirit at Table Grove High School. 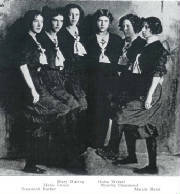 Check out these cheers found in the yearbook of 1910. The Table Grove High School kids were active in many other activities in addition to athletics. FFA, FHA, GAA, student government, choir, band, school dances, and plays were all likely a part of the TGHS experience. "I'm an alumnae of VIT HS - 1950, attending there my sophomore through senior years. 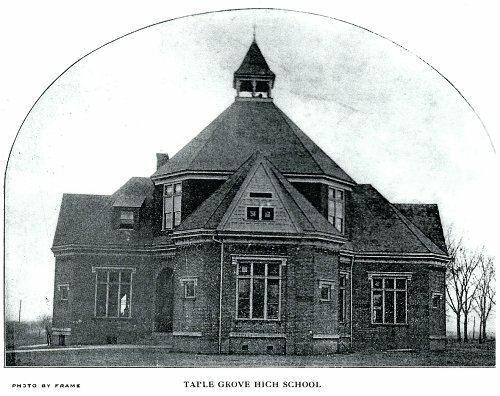 Thus I remember the original Table Grove High School which I attended my freshman year. The school team uniform colors were purple and white. The school fight song was the "Washington and Lee Swing". 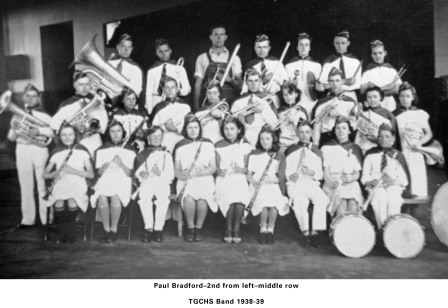 I still play it in a community band today and always think --- " and when those TG Tigers fall in line" --- as we play the song. I also started my education in the very old TG school which you picture. We never were allowed to go up to the second floor since it was the original HS rooms and was closed off. As little kids we always wondered what mysterious things they'd find up there. After the consolidation of three towns I went to high school in the 1920s building. To have enough room for all they moved in old army barracks from Camp Ellis which was a temporary post nearby. Shortly after I graduated they built complete complex of schools. All the old buildings are long gone. A nice page. Thanks for sharing all that material with us old folks."